Join our North Pole Team! Best Santas is currently accepting applications for interested Santas-to-be! Think you’ve got what it takes to fill the big man’s boots?! Our Santas provide entertainment and photography experiences at private parties, corporate events, and community functions. We have a one-hour booking minimum and entertain at events from one hour to several hours. This is a part-time contracted position and the majority of our events are on the weekends, with weekday events on occasion. The amount of hours you’ll be needed will vary. Having substantial weekend availability, specifically for the three weekends proceeding Christmas, is essential. • You must be able to pass a background check. • Our Santas provide entertainment for high-end events and our clients have high expectations, as do we. For this reason we are quite selective and attendance at our Santa School is by invitation only. We’re looking for Santas with a passion to serve children and families and with love for the Spirit of Christmas. • We do not have a specific height and/or weight requirement, however, you must generally have the appropriate body shape/style to be Santa. If you were fully decked out in Santa costuming, would you generally look like the image in your mind’s eye of Santa? If in doubt, zap us an email with some photos before you apply (Allen@bestsantas.com). • This is a contracted (non-employee) position and we pay via direct deposit weekly. • You are required to have reliable transportation to get yourself to and from the gigs. • You must have easy access to email and Google Calendars, as this is how gigs are offered to our Santas (we will provide training on this). • You must have a real beard that is white or that you’re willing to bleach white. We have Santas on our team who do not have naturally white hair. They’re able to bleach their hair and beard white, and then return it to their natural color after the season. • You are not required to have performer’s liability insurance, however, events that require insurance will only go to insured Santas (most clients do not require insurance). • Compensation starts at $100 per hour for Santa (after Santa School training). Some locations pay more. Our clients also occasionally provide gratuity, which is fully yours to keep. • Santa School is provided at no cost to you, but is by invite only. • A “Kringle Mingle” cookies and milk party Friday evening. • Catered lunch Saturday and Sunday during Santa School. • Professional and detailed training with earned diploma. • Upon completion of Santa School you’ll receive an invite to our private ‘Social Santa’ FaceBook group. 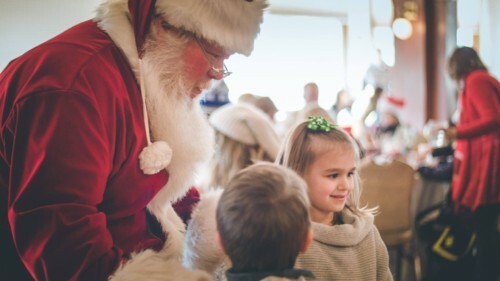 • Those who successfully complete Santa School will also be added to our Santa roster and will be eligible to receive work from Best Santas starting at $100 per hour. • Take a browse around our website to learn more about us. Thanks for your interest; I look forward to hearing from you!